The Natural Resource Governance Institute (NRGI) and its partners are pleased to announce course offerings for 2018. NRGI offers global and regional courses (both in-person and online) that are tailored to civil society advocates, government officials, journalists, parliamentarians and other actors who are working to improve the management of oil, gas and minerals. Using participants’ own experiences as a launching pad for learning, our approach centers around in-depth discussions and policy labs that allow participants to apply new knowledge to their current professional roles. Courses encourage participants to examine and debate the pros and cons of policy decisions from various angles. Thanks to generous donor support, NRGI offers a number of scholarships that are available to eligible participants from select countries. This page will be regularly updated as new information about courses becomes available. Announcements on courses will also be made via NRGI’s Facebook and Twitter feeds. NRGI, the Columbia Center on Sustainable Investment (CCSI), the World Bank, and the Sustainable Development Goals (SDG) Academy (the educational arm of the United Nations Sustainable Development Solutions Network) will offer “Natural Resources for Sustainable Development: The Fundamentals of Oil, Gas and Mining Governance.” This massive open online course (MOOC) is designed for the participation of large numbers of geographically dispersed students. The course stretches over 12 weeks and covers a range of topics, including the challenges and opportunities that come with extractive industries, key political economy considerations, legal frameworks, tax policy, environmental issues, community rights, artisanal mining, economic linkages to the wider economy, and the management and investment of revenues for sustainable development. Each week, students will have access to around one hour of recorded video lectures that will be led by a diverse faculty of world-class experts and practitioners, including Professor Sir Paul Collier and Professor Jeffrey Sachs. In addition to completing key background readings, engaging in online forums and taking quizzes, students will have the opportunity to ask experts questions in weekly Q&A sessions. The course is particularly suitable for those who seek to build a solid understanding of the natural resource management field. The first facilitated edition of the MOOC was launched in February 2016, and the revised course with new additions and updates will run on 5 February 2018. Access to the course requires a reliable Internet connection. To register for the 2018 facilitated MOOC, please click here. Starting in 2018, web users will be able to explore natural resource governance in Petronia through NRGI's new interactive web platform. 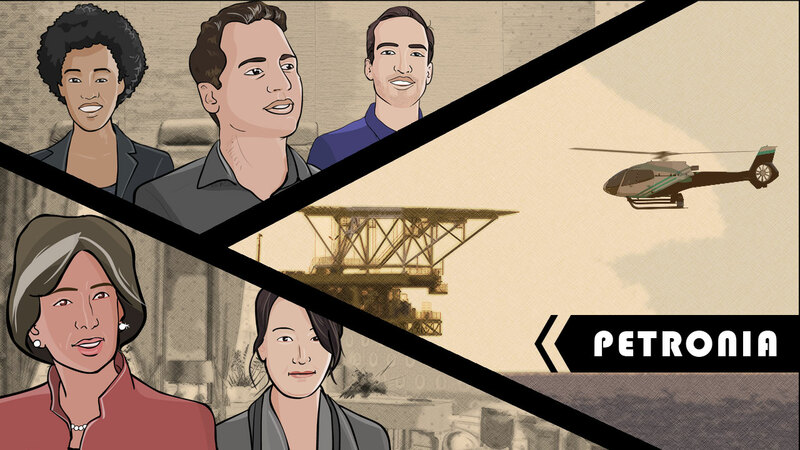 Petronia is a simulated learning experience that explores the policy challenges of a fictional developing country that makes an oil discovery that could change the course of its development. Online learners join a team of experts who are deployed to advise Petronia's policymakers in a series of complex resource governance scenarios that are based on models and case studies developed by NRGI experts. Learners interact with their team and Petronian clients, choose their own interests, set their own learning pace, and along the way build their knowledge of the issues, stakeholders, and complex tradeoffs that are involved in managing resource wealth for development. This course combines the best of NRGI's learning tools—including animations, graphics, case study approaches, problem solving and data analysis—while also providing greater accessibility to a general audience. The full learning experience takes from 90 to 120 minutes and is suitable for users who may not be ready to make the more significant time investments required by the MOOC or in-person courses. The platform will be available on NRGI’s website starting in 2018. To be notified of the platform launch, please register here. This advanced course (offered in partnership with the School of Public Policy at the Central European University) is open to exceptional individuals from governments, civil society, parliaments, media, international development agencies, industry associations and academia who already have a solid understanding of natural resource governance and seek to enhance their knowledge and skills. A limited number of scholarships (covering travel, accommodation and tuition) are available on a competitive basis for leaders from governments, civil society, parliaments, and media from the following countries: Colombia, the Democratic Republic of Congo, Ghana, Guinea, Indonesia, Mexico, Mongolia, Myanmar, Nigeria, Tanzania, Tunisia and Uganda. Individuals from other countries and sectors are welcome to apply for the course but will not be considered for scholarships. Donor and partner organizations may wish to provide additional scholarships. The cost of tuition is EUR 2,800 (this does not include travel, accommodation and dinners). Watch a short video on Reversing the Resource Curse: Theory and Practice. Visit NRGI’s course page to find contact details for inquiries and additional information on course content, faculty and requirements. NRGI and the University of Oxford’s Blavatnik School of Government (BSG) offer an annual high-level executive course on natural resource management for the most senior policymakers in government (e.g., ministers, deputy ministers, heads of agencies, departments and state-owned enterprises, as well as high-ranking members of parliament) and leaders in the private sector and in the donor community. This intensive five-day course provides the training and insight policy leaders need to work toward better management and governance of oil, gas or mineral resources. The course builds a better understanding of both public and private sector interests and facilitates dialogue and the mutual appreciation of the positions held by different groups. More information on tuition and available funding will be available in April 2018. Visit NRGI’s course page or BSG’s course page to find contact details and more information about the course. NRGI runs a comprehensive, intermediate-level summer school for participants from Anglophone Africa. The two-week residential course covers fundamental governance issues in the natural resource management decision chain. It also seeks to deepen participants’ knowledge and analytical skills in areas of fiscal and revenue management policies, Extractive Industries Transparency Initiative (EITI) reports, contracts and key legislation. The course is open to government officials, civil society actors, journalists, parliamentarians and private sector actors. Attendance costs USD 2,500 (inclusive of accommodation, food and tuition). Watch a short video on the Anglophone Africa knowledge hub course. For more information, please contact Nafi Chinery at [email protected]. In partnership with the Centre d’Excellence pour la Gouvernance des Industries Extractives en Afrique Francophone (CEGIAF) at the Catholic University of Central Africa, NRGI delivers a two-week intermediate-level summer school on extractive resources governance in Yaoundé, Cameroon. The course is open to civil society actors, journalists, parliamentarians, mayors and senators with at least two years’ experience promoting good governance in extractive industries. The course covers the decision chain, including the decision to extract, legislation, contracts, taxation, collection and management of revenues, social and environmental impacts, and the impact of extractives on development. Three months of online preparatory activities will precede the two-week residential course. Preparatory work will commence on 1 March 2018. Attendance costs approximately USD 2,700 (inclusive of flights, accommodation, meals at venue and tuition). For more information, consult NRGI’s course page or contact CEGIAF at [email protected]. Watch a short video on the Francophone Africa hub. En partenariat avec le « Centre d'Excellence Pour La Gouvernance des Industries Extractives en Afrique Francophone » (CEGIAF), de l’Université Catholique d’Afrique Centrale, Yaoundé, Cameroun NRGI offre un cours d'été (‘l’université d’été’) de niveau intermédiaire sur la gouvernance des ressources extractives, d’une durée de deux semaines à Yaoundé au Cameroun. L’université d’été est ouverte aux acteurs de la société civile, aux journalistes, aux parlementaires, aux maires et aux sénateurs engagés dans la promotion des industries extractives (IE) dans leur pays depuis au moins deux ans. Elle couvre la chaîne de décision des industries extractives: la décision d’extraire, la législation, les contrats, la fiscalité, la collecte et gestion des revenus, les impacts sociaux et environnementaux, et l’impact des ressources extractives sur le développement. Elle comprend des activités préparatoires de trois mois, qui se font en ligne et le cours d’été de deux semaines en résidentiel. Les travaux préparatoires débuteront le 1 mars 2018. Les frais de cours, y compris le transport par vol, l'hébergement, les repas et les frais de cours, sont d'environ US$2,700. Pour plus d'information, consultez la page dédiée à ce cours sur le site de NRGI ou contactez le CEGIAF [email protected]. In partnership with the School of Politics and Government at the Faculty of Social and Political Sciences, Universitas Gadjah Mada, NRGI runs a two-week intermediate-level course, “Advancing Accountable Resource Governance in Asia Pacific.” The course is open to civil society organizations, legislators, national and subnational government officials, staff of state-owned enterprises, professionals involved in oil, gas and mining companies, people in academe, and media practitioners in the Asia-Pacific region. Attendance costs approximately USD 2,300 (inclusive of accommodation, food and tuition). For more information, consult the course page or contact Muhammad Djindan, Asia-Pacific hub manager at [email protected]. In partnership with Khazar University, NRGI offers a comprehensive course on the extractive industries decision chain and thematic courses in issues relevant to the Eurasia region. These include EITI, revenue management and economic diversification in periods of low commodity prices. Courses are open to civil society actors, government officials, journalists and researchers. Watch a short video on the Eurasia hub. Core course (eight days): A decision chain course based on the Natural Resource Charter, this core course helps participants understand the linkages between extractive sector transparency, accountability and management issues. Blended Learning Course in Revenue Management of Natural Resources (10 days): A 6-month, advanced-level certificate program in revenue management of oil, gas and mining sectors for mid-level professionals with experience in government and public sector; oil, gas and mining company employees; members of the academic and policy communities; and members of nonprofit organizations from Eurasia (1) that are engaged in any stage of the decision chain of natural resource extraction, production, management and its impacts on the producer country’s socio-economic development. Combining online learning and residential modules, the program will cover a wide range of topics around revenue management and revenues’ use for sustainable development in resource-rich countries. The program will commence in February, 2018. Costs vary by course, with the core course on the Natural Resource Charter Decision Chain costing $2,625 (inclusive of tuition, food at venue and accommodation). All course dates will be confirmed closer to time. For more information about Eurasia Hub courses, visit NRGI’s course page or contact Nazaket Azimli, Communications and Development Manager at [email protected]. В сотрудничестве с Университетом Хазар, NRGI предлагает всеобъемлющий курс по цепочке решений в добывающих отраслях и тематические курсы по важным вопросам для Евразии, такие как Ининциатива Прозрачности в Добывающих Отраслях (ИПДО), управление доходами и экономическая диверсификация в период понижения цен на нефть и газ. Курсы открыты для членов гражданского общества, госчиновников, журналистов и исследователей. Основной курс (восемь дней): Основываясь на Хартию Природных Ресурсов, этот курс по цепочке решений помогает его участникам понимать взаимосвязь между прозрачностью добывающего сектора, подотчетностью и вопросами управления как единой системой. Планируется в мае 2018-го года. Смешанный Курс по Управлению Доходами от Природных Ресурсов (10 дней). Курс предлагает 6-месячную программу по управлению доходами от нефти, газа и горной добычи для профессионалов среднего уровня имеющих опыт управления в правительстве и государственном секторе, добывающих компаниях, академических и неправительственных организациях Евразии(2) вовлеченных в одну из фаз цепочки принятия решений. Комбинируя модули по дистанционному и резидентурному обучению программа охватывает широкий темы по управлению доходами и из использование для устойчивого развития. Сертификкатная Программа начнется в Феврале 2018-го года. Стоимость курсов отличается, однако стоимость основного курса по цепочке решений Хартии Природных Ресурсов составляет $2,625, включая оплату за обучение, расходы на проживание и питание. Даты курсов предворительны и будут утверждаться. Для дополнительной информации о курсах Евразийского Центра, посетите страницу NRGI по курсам или свяжитесь с Назакет Азимли, Менеджером по Коммуникации и Развитию Евразийского Центра по адресу [email protected]. NRGI’s priority countries in Eurasia are Afghanistan, Albania, Azerbaijan, Kazakhstan, Kyrgyzstan, Mongolia, Tajikistan and Ukraine.